For the last few years, each November Decanter magazine have hosted what has been easily the best consumer tasting event in the wine calendar. For relatively little dosh (this year £26 a ticket) you get plush surroundings (the Landmark hotel), Riedel tasting glasses, ample provision of spittoons (a vital feature unless you enjoy getting completely blottoed), and most importantly a stunning line-up of producers. The crowds aren't too bad, and there really is more than you can do in a day. And that's without taking into account the series of 'masterclasses'. This year, for the first time, a second event has been scheduled. Dubbed the 'Rising Stars' encounter, it was designed to showcase emerging fine wine producers. While cynics might argue that most of these producers have already well and truly risen, it was another impressive line-up, and only slightly less compelling than the November bash for about the same money. The masterclass selection was, however, a bit less interestingthe line-up here was stronger at last November's Fine Wine Encounter. Having said that, there are precious few similar chances to try wines like these, so I won't be too critical, and the German Riesling tasting I attended was the pick of the bunch (report to follow). 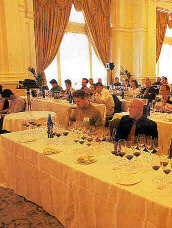 Photos courtesy of Decanter. Jamie Goode received complimentary tickets to the Rising Stars event and the Riesling Masterclass.